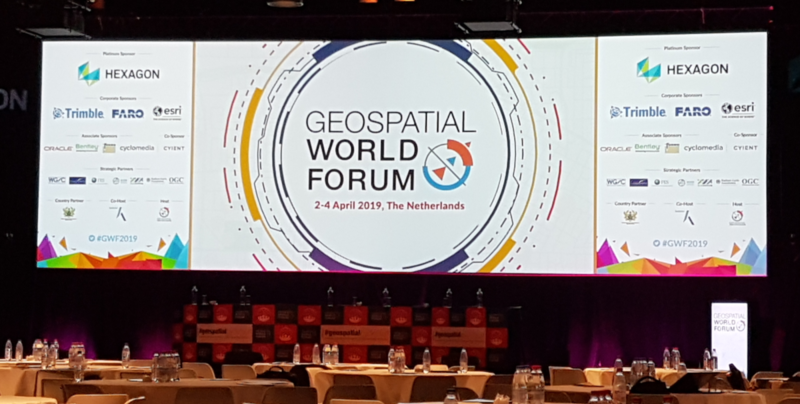 This week I’m in Amsterdam at the Geospatial World Forum 2019 which is taking place from Tuesday 2nd April to Thursday 4th April, and I’m speaking on day two. The theme of the event is #geospatialbydefault – Empowering billions! and is looking at how the expanding geospatial market is reaching out beyond its traditional boundaries and look to have a wider impact on the general public. The GPS in your phone is one example of how geospatial technology has become part of everyday life, but the next development step is to enable the businesses and the wider population make geographic information a common language for everyone around the world. This can present a lot of opportunities and has the potential to deliver a range of benefits. Geospatial World Forum is taking place in the Taets Art and Event Park on the Amsterdam North Sea Canal. Historically, the site was used to manufacture munitions and was part of the Hembrugterrein, a defence line consisting of forty-six forts, batteries, locks and dykes. The first day was dedicated to a number of plenary sessions. The Dr Roger Tomlinson Memorial Lecture was given by Prof. David Maguire, Vice-Chancellor of the University of Greenwich. He reviewed the history of Geographic Information Systems (GIS) and Geographic Information (GI) Science. The first GIS was developed in the early 1960s by Dr Tomlinson and he became known as the “father of GIS”, with his work very much driven by the need to build a practical information system – an important focus for us all to remember. Afterwards, Prof. Maguire discussed the future with Jack Dangermond (co-founder of ESRI) – described as evolving at scale with science as a foundation and an emphasised on the importance of smartphones and their connectivity using 5G. A further point of discussion during the day was that everything is now dynamic – even the background map is starting to become dynamic. Unsurprisingly, I’m speaking in the Commercialization and Democratization of Earth Observation stream. I’m talking this afternoon in the day two session on the Entrepreneurship and New Business Models Disrupting the EO Industry session of this stream. This session is about how new commercial EO organizations are applying new business models to the sector, and the keynote will be given by Shawana Johnson, Global Marketing Insights, USA. I’m talking about how Pixalytics is evolving its business model from service driven approach to a products driven approach, and speaking alongside me are Rani Hellerman, RBC Signals, USA; and Alexis Hannah Smith, IMGeospatial from the UK. The event has been really interesting so far, I’ve met some new people and I’m looking forward to the Earth Observation focus of today – hearing views on how the industry is developing. This entry was posted in Business Innovation, Copernicus, Data, Earth Observation, Growth, Micro Business, Professional Development, Remote Sensing, Satellite, Space Can Help, UK Space Industry and tagged Amsterdam, Artificial Intelligenc, Commercialisation, Democratization, Earth Observation, Entrepreneurship, EO, EO Industry, geospatial, Geospatial World Forum, New Business Models, pixalytics, satellite, Space, Taets Art and Event Park by Sam. Bookmark the permalink.